Over the past few months, democracy protests have broken out across the Muslim world. In December 2010, protests broke out in Tunisia following the police abuse and subsequent suicide by immolation of a street peddler. Less than a month later, Ben Ali, Tunisia’s dictator fled to Saudi Arabia. From Tunisia, the democratic protests spread to Egypt. Protesters crammed the streets of Egypt’s major cities demanding the resignation of Hosni Mubarak. As the Egyptian army looked on, Mubarak announced that he would not seek re-election this September and promised reforms. On February 11, President Mubarak finally stepped down and handed over control of the country to the military. The protests do not stop there. Democracy advocates in Yemen are demanding reform. In Jordan, the king dismissed the cabinet and appointed a new prime minister in an attempt to mollify protests against his government. There is still opposition to the Iranian government in spite of the regime’s crackdown on protests there in 2009. Protests against entrenched Muslim dictatorships have even reached Syria, where students rallied against security forces after police beat a young man in the capitol. 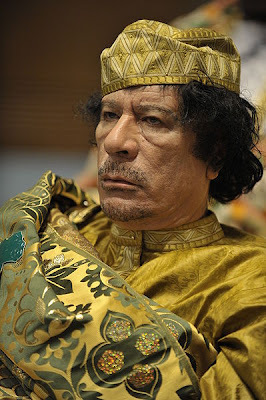 Will Gaddafi be the next Muslim dictator to fall? Most recently Georgians have watched in horror as protests against the governments of Bahrain and Libya have turned violent. The two countries are very different. Bahrain is a wealthy ally of the United States, while Libya is a poor country ruled by Moammar Gaddafi, a longtime sponsor of terrorists. The governments of both countries have apparently been unnerved by the events in Tunisia and Egypt and have decided that heavy-handed crackdowns on the protesters are the only way to preserve their power. The Muslim world, characterized by authoritarian governments and a populace that ranges between a few extremely wealthy and the majority who are extremely poor, has long been ripe for revolution. It is not surprising that the people of these countries would look at the prosperity of the rest of the world (even in a recession) enviously. The US unemployment rate is over 9%, but the unemployment rate in these Arab countries is often much higher. The peddler who started Tunisia’s revolution was a college graduate and father who could find no other job than selling food on the street. Unemployment and low wages couple with rising food prices put average Arab families in a precarious position. 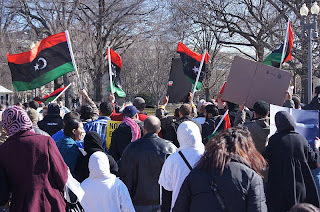 When pro-democracy Muslims saw the success of democracy in Iraq and Afghanistan, it undoubtedly inspired them to seek change in their own countries. When the people had their first success in Tunisia dominos started to fall in other Muslim dictatorships. The success in Egypt further emboldened democracy protests around the Middle East. The domino theory is in action as one dictator after another is threatened and falls to a popular uprising. Many Georgians are understandably concerned where the Middle Eastern upheaval will lead. Many Georgians have already been actively involved in two wars in the Middle East. There is justifiable concern that radical groups like the Muslim Brotherhood will hijack these democratic revolutions in favor of Islamic theocracies. It would be a mistake for the United States to continue backing unpopular dictators out of fear of a takeover by radicals or higher oil prices. The people of the Middle East are willing to risk their lives to fight for what America possesses and has long believed is the best choice for the world: freedom and democracy. It would be hypocritical and tragic of the United States not to aid proponents of democracy (as we failed to do in Iran in 2009). What the US can and should do is to aid democratic movements around the world. As dictators topple, US democracy advisors should be dispatched to help newly free people learn to preserve their freedom. This tactic was used in Eastern Europe after the fall of the Soviet Union successfully. Democracy and capitalism have taken root in several countries there, many of which already have lower taxes than the US! By giving support and aid to democracy groups, we would also counter the support that Iran, al Qaeda and others will undoubtedly be giving to radical groups. Now is not the time for the US to abdicate our responsibility for spreading democracy and freedom around the world. The revolutionary wave sweeping the Middle East is a once in a lifetime opportunity. The people want freedom and they are willing to die for it. If the opportunity is missed, or seized by Islamic radicals, it may mean that more Georgians will one day have to fight wars in Middle Eastern deserts. The question is in which Middle Eastern country democracy will strike next and whether the US will be ready.